1. 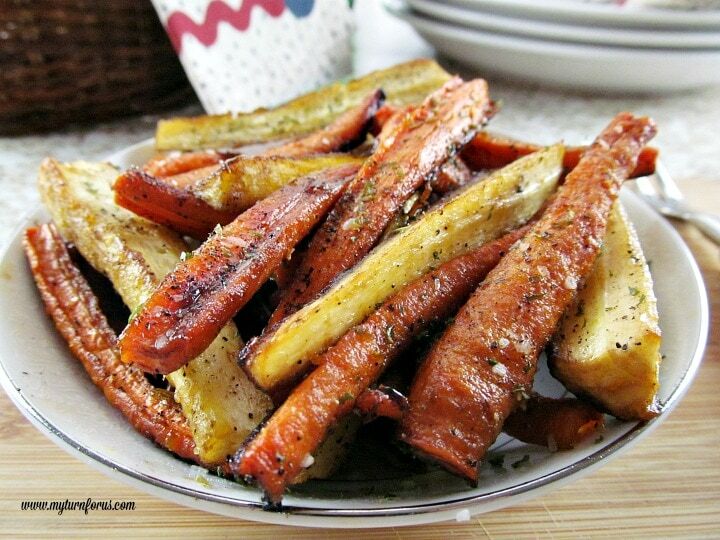 Are you looking for another way to serve carrots? 2. 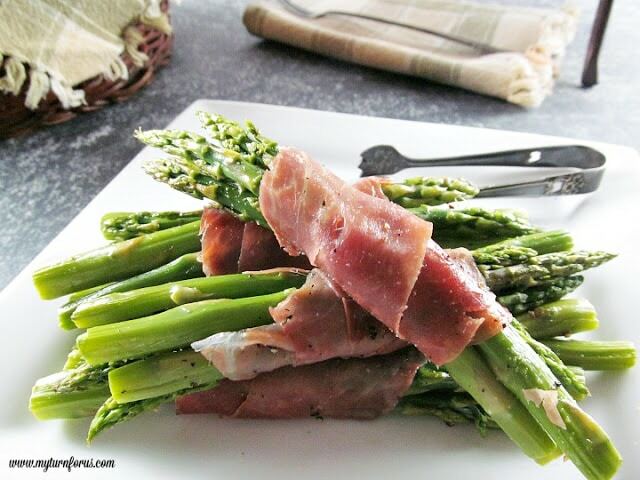 Are you looking for healthy ways to incorporate more vitamin rich foods into your weekly menu? 3. And have you ever tried a parsnip or would you like to? If you answered yes to any one of these questions, then keep reading, if not scroll to the bottom of this page and I’ll have some other vegetable suggestions for you. See we aim to please here! If you are not familiar with parsnips, they are very similar to carrots except they are white and have a nuttier earthier taste. 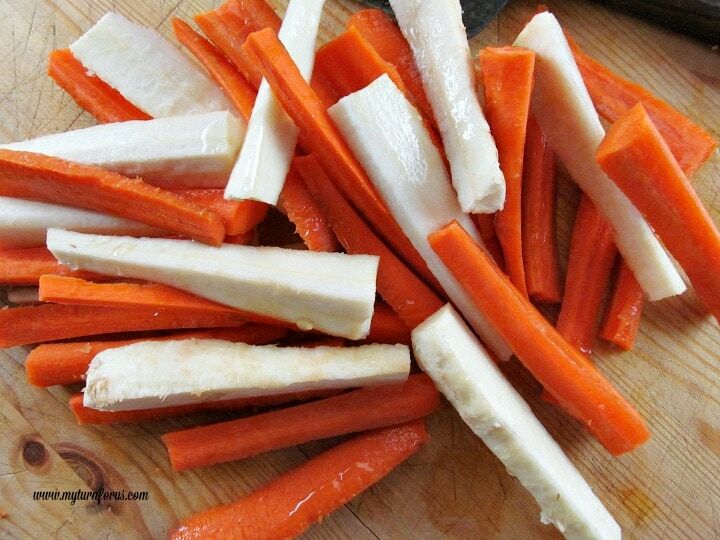 Parsnips are great to pair with carrots because of the similar size and taste but they are just different enough to make an interesting dish. 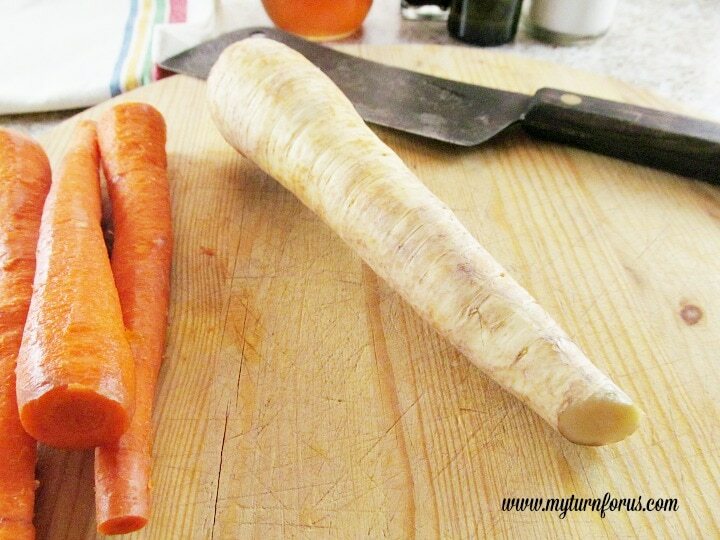 When the carrots and parsnips are cut into sticks, they get along nicely and look so pretty. 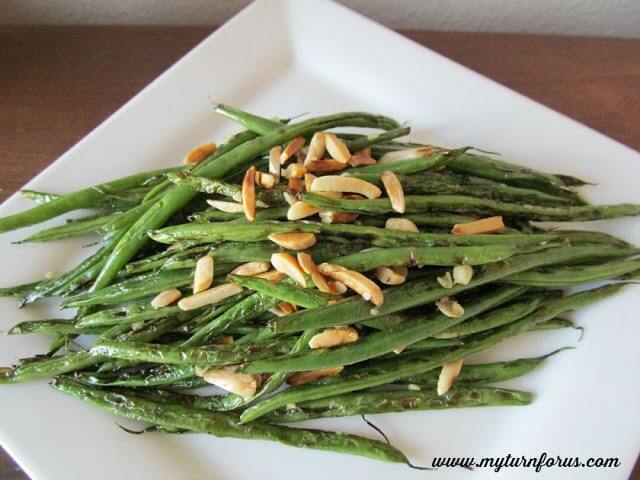 Dipped in a mix of balsamic vinegar, olive oil and honey, with a few seasonings added. 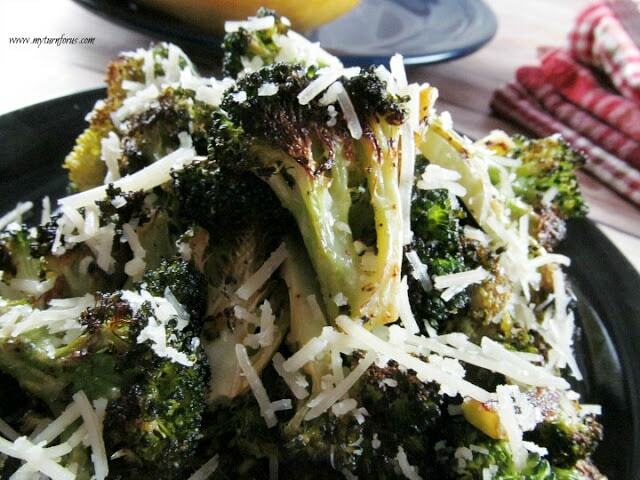 Finish them off by baking in a 400 F degree oven for 25-30 minutes. 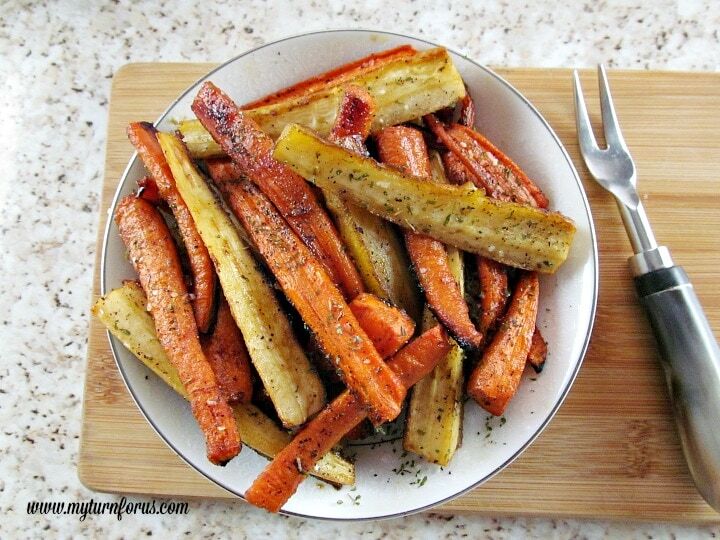 We are not sweetened vegetable “likers” here on the Ranch, we don’t put marshmallows on sweet potatoes and we don’t normally sugar carrots, we love the naturally sweet taste of a perfectly roasted veggie with just a minimal of seasonings. Not that there is anything wrong with adding sweetener to a vegetable dish, go ahead and top those sweet potatoes with marshmallows and toss a little sugar on those carrots, we’ll still love you! 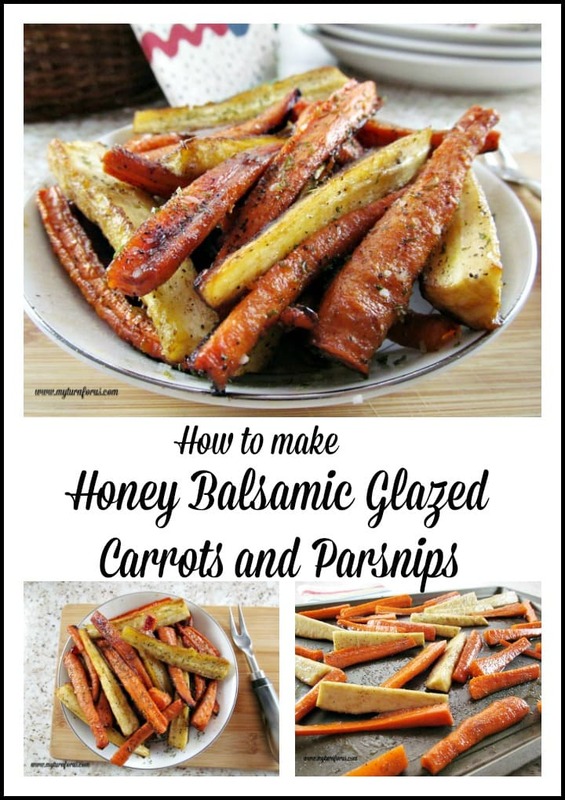 But we did add honey to this Carrot and Parsnip dish, it’s offset by the balsamic vinegar, and together they come together to make a light glaze that’s not too sweet and not too acidy. These little sticks can be served as a beautiful side dish for dinner parties, Thanksgiving dinner or on the side with burgers or hot dogs. 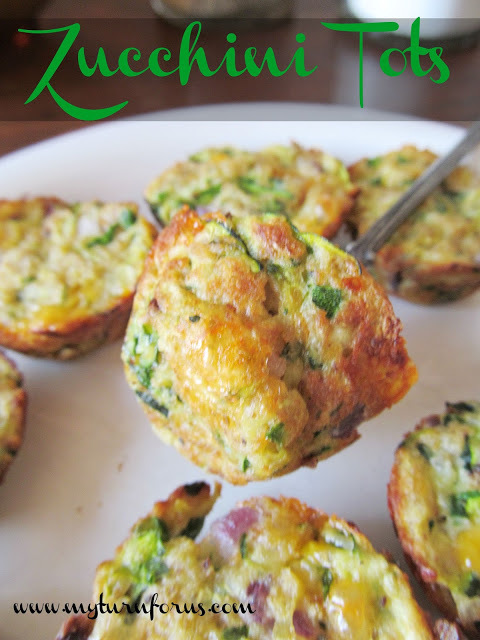 It’s a versatile dish is visually similar to fries. 3. In a medium bowl, whisk together honey, balsamic vinegar, and olive oil. 4. 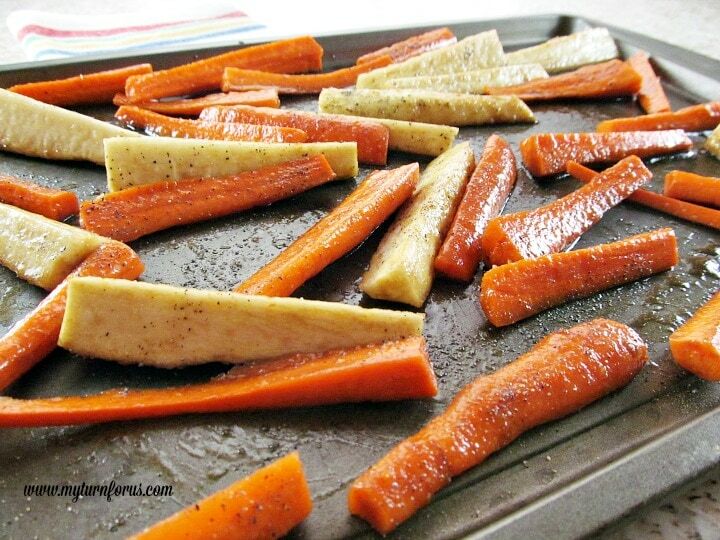 Toss carrots and parsnips in the balsamic mixture. 7. Garnish with sea salt, pepper, and parsley to taste.